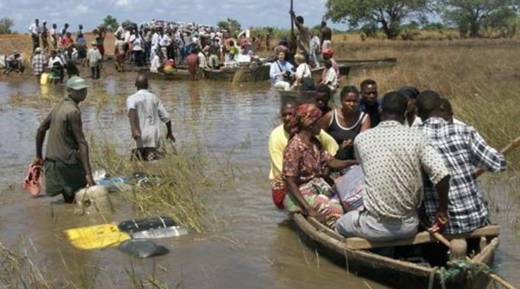 Cyclone Idai: people seeking rescue through flood waters. CAFOD is working to reach hundreds of thousands of people affected by Cyclone Idai, across Southern Africa. "154 is now the current death toll, with 187 missing, but these figures are expected to rise as aid workers gain more access. 16,000 people are now homeless and in need of shelter." 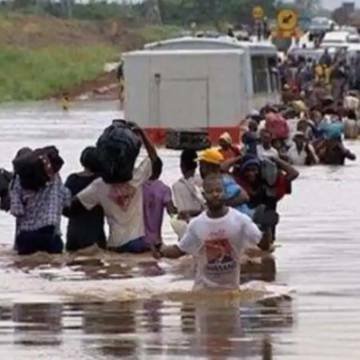 On the 14 to 15 March, Cyclone Idai made landfall in central Mozambique, near Beira City, Sofala Province, leaving almost 90 percent of the city submerged in flood water. The cyclone also hit Zimbabwe and Malawi, destroying homes, roads, bridges, and vital crops, in its wake. Hundreds of people have died, and thousands of people are in need of vital humanitarian aid to survive the coming days and weeks ahead. What are the needs of those affected by Cyclone Idai? Working with our local Caritas emergency response experts, rapid assessments are already underway in some of the worst affected areas in Mozambique – Beira, Dondo, and Caia, where the priority is to reach 1,400 vulnerable people, with food – rice, beans, sugar and cooking oil, as well as hygiene kits. In eastern Zimbabwe, our local emergency experts are doing rapid assessments in the Chimanimani and Chipinge area, where it’s estimated that at least 9,000 people need vital humanitarian aid, including clean and safe water, basic shelter, and food. But many districts remain inaccessible, so this number is expected to rise. Our local partners are working around the clock to reach areas and communities affected by the Cyclone. Their local knowledge is vital in ensuring that the most vulnerable families are reached with the basic aid they need to survive.